I went to Meaghan in late pregnancy, and I was so grateful for her care. She set me up in a way that was very, very comfortable for my changing and achey body (it was so nice to be "on" my stomach at 8 months!). Her massages were always a great combination of relaxing and therapeutic. Plus she let you choose your own music! "I am very grateful to Dr. Jeda Boughton. She has truly changed my life by giving me a chance at a better quality of life, and I know she will continue to support me as I get stronger and evolve. The healing synergy is exceptional. Thanks to the "Team" who have been such a wonderful help on my journey – including Reese. I love you to pieces. Namaste." I’ve been treated by Acupuncturists regularly for over ten years. Kristen is the first practitioner to provide holistic wellbeing in the long term with immediate results in diminishing digestive symptoms like bloating and fatigue. She’s earnest and passionate about acupuncture. As a Registered Massage Therapist, I often refer out to Kristen as a complementary treatment for general health and balance. "We had experienced many years of fertility challenges and were about to give up. Dr. Jeda Boughton was integral in the process of our getting pregnant, staying pregnant & now in post-pregnancy care. We credit her expertise and contemporary approach in Acupuncture and Traditional Chinese Medicine. I especially appreciate her sensitivity, gentleness and being so easy to talk to. I would not hesitate to recommend anyone to Dr. Boughton." Both of my lower legs – shins and calves – hurt to the point of not being able to even stand comfortably for more than a few minutes. This was a recurring problem that had built up over the last ten years of activity and poor choice of footwear. Over a few sessions with Kristen – after a detailed consultation – she applied acupuncture and gua sha and sent me home with self-care advice to aid my recovery. After a few treatments, I was able to ease back into activity as usual, and with better ability to anticipate and deal with issues before they reached a critical point. Kristen focuses on helping you not only resolve your immediate issue but achieve optimal health via treatment and self-care. Her style is warm, compassionate and professional, and I would especially recommend her for newcomers to acupuncture. My initial consultation with Kristen was very thorough and comprehensive. So many questions about my health! But that is why I have got such wonderful results. My arthritis pain has gone. I have been treated for different conditions including frozen shoulder pain, foot pain and elbow pain. In each instance the recovery was quick, real and lasting. I also felt that I had less anxiety and more energy after each treatment. I would recommend Kristen as empathic, knowledgeable and professional. "The care I received from Dr. Boughton truly helped me alter the way I viewed my overall health. Dr. Boughton supported me in overcoming excruciating back pain, severe digestive problems, headaches, and overall sense of stress and anxiety. Even more importantly, once she had helped me restore my health, she supported me in maintaining a balanced and healthy life. Thanks to her patience, care, and expertise, I feel better than I ever have." "Clearly you're a miracle worker. It seems that the herbs and acupuncture has helped me and my myriad health issues enormously. Just this weekend I had some evidence that my body was FINALLY returning to normal. It's a huge relief and I don't think I could have sped the process along without your amazing counsel, and the herbs and the treatments I've been receiving. It's so wonderful to see some evidence that I'm getting back control of my own body. I look forward to continuing the process and wish to thank you for your tremendously healing ways!" "My husband and I had tried for over 2 years to conceive for a second time. After surgery to remove a blocked fallopian tube and one failed IVF cycle, I began to see Jeda for acupuncture treatment and Traditional Chinese Medicine (herbs). Several months later (a week before starting another IVF cycle), we were ecstatic to find out we were pregnant. I continued to see Jeda for herbs (I won’t lie - they taste horrible!!) and acupuncture treatments to help sustain the pregnancy and relieve some back and leg pain. By the end of the third trimester, Jeda focused the treatments on preparing my body for a healthy delivery and my precious little girl arrived on February 20, 2008! I can’t say enough about the support and care I received while seeing Jeda. She is very professional and knowledgeable and truly cares for her patients. I would highly recommend Jeda Boughton to any woman dealing with fertility issues or wanting to ease the aches and pains of pregnancy." 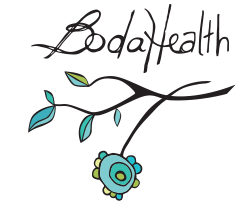 "My practitioner at BodaHealth is Dawn Sells. She has been my RMT for over two and a half years. I started seeing Dawn when I was in Nursing school, and essentially every muscle in my body was stressed and tense. Overtime Dawn has helped me with various musculoskeletal issues, particularly in my upper back, neck and jaw. During training for numerous half marathons Dawn has also been able to help me with injuries, strains and pure relaxation. Dawn always has a calm demeanour. She definitely has a holistic view, recognizing the intimate connections between the mind and body. While I visit Dawn for "physical" therapy, she definitely helps with psychological side of things too! Each session she takes the time to check-in about your life. Dawn will remember about your holiday plans, your work schedule, your hometown and how warm your like the massage table. I continue to come back to Dawn both because of her talent as a RMT, and because of our long standing relationship. She knows my body and what works well. I have visited other RMT's over time where you walk out of the office feeling in pain, but thinking "pain for gain". This is never the case with Dawn. She managed to treat my body effectively, without discomfort. I would highly recommend Dawn as a respectful, kind and talented RMT (as well as having a great view from her massage table at BodaHeath!)." Thanks for all the fabulous massages! "Some years ago back surgery fixed a blown disc to relieve a compressed nerve. Currently, I lead an active life of working full time at a desk job, swimming up to 9kms per week, gardening on the weekends, etc. I have a tendency to do too much physical work, like carrying heavy things, cutting the lawn, weeding, pruning, sitting at my desk for hours forgetting to stretch or take a break. Acupuncture, administered by Dr. Jeda Boughton, has saved my tight, inflamed and overused muscles, eased the pressure on the sciatica nerve and tamed the militant piriformis countless times. Some people run to the medicine cabinet for pain or inflammation medicine. I run to Dr. Boughton's needles for immediate and long-term care." When I was diagnosed with Graves’ disease (hyperthyroid disorder) in 2008, my doctor sent me immediately to an endocrinologist. I was told about two options for treatment, and both alarmed me. One involved radioactive iodine, while the other involved medication with side effects that I wasn’t at all happy about. Everything happened very quickly and the specialist had little patience for my questions and concerns. I was unsure about alternative medicine, but Jeda’s exposure to Western medicine as well as her training and personal experiences with acupuncture and Chinese medicine reassured me. She spent a lot of time answering my questions and patiently explaining (with diagrams!) what was happening in my body/brain/hormone system. She was thorough, open, and straightforward in her discussions with me, not to mention warm, caring and good humoured. I decided to go ahead with treatment, despite warnings from the endocrinologist. The symptoms I’d been living with were awful. I was hungry and eating constantly, had lost a lot of weight (down to 103 lbs), my muscles had atrophied to the point where I was struggling to open those doors to downtown buildings. I was anxious and upset, ‘hyped up’ yet exhausted. I had tremors all over my body, all the time – this was the worst of the symptoms - and my pulse was pounding in my ears: 101 lying in bed in the mornings. It was such an enormous relief when, within two weeks of herbal treatment, acupuncture and diet, my symptoms began to subside. I actually began to feel like a normal person again. 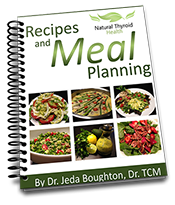 It took several months (which Jeda had predicted) of slow, patient, careful treatment to gradually get to ‘normal’ thyroid functioning, but right from that first two weeks of treatment, I knew this was the way to go for me. I’ve been seeing Jeda regularly ever since and my health has been better than ever before. I feel good and I have so much energy! Any time I have a temporary thyroid swing, we’re always able to go back to the herbal treatment and bring things back on track again. I know it may sound ‘corny’, but meeting Jeda and trusting in her expertise and care has been life-changing. I am so grateful for her knowledge, skill, and compassion and to have her in my life as someone I can rely on and trust with my overall health. "I am very grateful to Dr. Jeda Boughton for her work with me. Using her knowledge of acupuncture and Chinese medicine, along with her gentle manner, she has helped clear painful blocks in several areas of my body. I also appreciate her excellent skills in assessing imbalances in my body and helping me improve the effectiveness of my immune system." I just wanted to send you our deepest thanks for all the acupressure info and tools you gave us! It really helped Nathan and I a lot with my labour. Our daughter Niyah was born on Saturday July 27 at 7 pm. My labour started at 11 am on the 27th and progressed very quickly. Because of all our tools, I had a completely natural birth and was able to manage the pain (almost a little too well, Niyah was almost born at home). The tools that worked the best for me were the frozen water bottles, the pressure bands on wrists and feet, and activating the pressure points in my legs and lower back. Thank you so much! Dawn Sells at BodaHealth is a life saver! I've had fibromyalgia for almost a decade and I know all too well what it is to carry around terribly painful tension in my muscles (especially in my neck and shoulders). Over the last 9+ months of working with Dawn, I've seen progress in the way of relieving migraines and working out specific areas of desperate tightness. She clearly knows her profession well and is able to key in on the sorest areas (even without me pointing them out) that are most in need of relief. I especially appreciate how she takes the time to really hear (and make detailed notes on) my progress/regress each time I come in and thus follows my case from visit to visit. It helps me remember that the important body work we're doing is building from treatment to treatment and really going somewhere. Of note are also Dawn's calming presence, gentle personality, and expression of care for me as a patient -- all of which make the session as relaxing as can be and make working with her a real delight. And if that's not enough, BodaHealth is a lovely clinic... you can't beat the beautiful view of the city! Thanks for doing the work you do, Dawn! "When I first visited Dr. Jeda Boughton I was suffering from severe neck and arm pain that just wouldn't go away. Initially, I was extremely anxious of needles and acupuncture, but Jeda's gentle and carrying touch quickly diminished all my fears. Acupuncture helped like nothing else. It fixed the pain that just wouldn't go away. But, my treatments with Jeda didn't stop just at relieving my neck and arm pain. With acupuncture she helped me release things I didn't even know were jammed up. With her knowledgeable and wholistic approach she quickly gained my full trust and turned my treatments into a great educational experience. I only wish I could see her more often." I wanted you both to know how nurturing it's been for me under your care the last 2 weeks... again I truly felt genuinely cared for in an outstanding way and the beautiful sincere spirit you both exuded has left me feeling enriched... I cannot thank you enough and I am feeling quite a lot better and fully on the mend and I know it's because of your true compassion and your expert acupuncture treatments... it was totally my pleasure to have met you both. "I saw Dr. Boughton a few years back for my insomnia. I found her to be extremely competent and caring and I was impressed with her answers to my never ending questions. Being a bit of a "sweet tooth" I did not like the taste of the herbs but I took them as they were prescribed and I'm glad that I did. The acupuncture treatments and not-so-awesome tasting herbs worked every time and I slept like a baby for 8 hours straight for days in a row. I haven't seen her in a while (thinking I was "cured") but am seriously considering another visit soon. Thank you Dr. Boughton for all your help and hard work." Pregnant after a long journey! "My second time trying to conceive proved to be much more challenging than the first. In total it took 10 months and since we were using assisted reproductive technology it was an especially challenging time in our lives. Dawn helped me relax in between and prior to my procedures. The time was very valuable to me since having a toddler meant that I wasn't getting very much down time on a day to day basis. I felt like the fertility massages were very useful in between fertility clinic visits, a difficult time because we would find out the procedure had not worked and were waiting to try again. The month we conceived Dawn gave me a massage just a few hours before my procedure and I really think it had a big impact on my body and mind. I was relaxed and confident going in and couldn't have felt any better. Thank you for all the support you gave me throughout past year. I highly recommend for anyone trying to conceive to try a fertility massage. It really does wonders for your mind, body and soul." Kristen is compassionate, caring, patient and focused, and knows her stuff. I came into her office on crutches, and left without them! I have been a client of Meaghan’s for over a year now, she was a life saver during the last weeks of my pregnancy. Meaghan is super personable and professional, making you feel at ease the minute she enters the room. She is an excellent communicator and passionate about what she does. I don't know what I would have done without her help. Kristen treated me for pre- and post-pregnancy pains with her customary delicacy, sensitivity, empathy and warmth. I was at total ease under her care, and recommend her without reservation. I am writing this letter to express my heartfelt appreciation for the outstanding support you and the BodaHealth team have provided me over the past year. You have made such a big difference in my health and overall well-being. I would strongly recommend your service to anyone experiencing the challenges I have with multiple sclerosis (MS) or other health conditions. Your holistic approach, including advice on stress reduction, sleep and diet, have helped me adjust my lifestyle in very beneficial ways. More specifically, acupuncture, herbal and massage therapies have combined to really help reduce my experience of symptoms associated with MS (such as muscle stiffness, numbness, fatigue, and trouble sleeping) and dramatically increase my quality of life. I have also found the BodaHealth team to be extraordinarily welcoming. BodaHealth is a very comfortable and positive place to be, and has served as a true “port in the storm” for me and my family (including my dog) in what have been very trying times. Finally, I also very much appreciate how BodaHealth has always been open and willing to collaborate with my more traditional medical health providers, including my GP and my neurologist. I feel as a result that I am doing everything I can to maximize my health, with BodaHealth serving a critical role in my health care team. Thank you so much, Jeda, to you and BodaHealth for your outstanding services." "Dr. Jeda Boughton is thorough. She took the time to listen to my concerns, get to know me (lifestyle, work, day-today), and ask a lot of questions to get a well-rounded view of me as an individual. She then provided an acupuncturist treatment specific to my concerns, as well as suggested some Chinese herb teas that have done wonders for my nervous system. I look forward to working with her more in the future. Even from the one visit, I feel so much closer to balance." "For Jeda: I wanted to let you know that my acid reflux is much better and things are settling down. Thank you again for being such a thoughtful and attentive listener. I noticed at our last appointment how carefully you were listening to how I was doing and also were open to my suggestions of what I think is working, or could work for me, with both the acupuncture and the herbs. Really, you are always like that, but as I am staring to have a greater understanding of things, I feel more confident to share my thoughts and opinions with you. The result is that we have a partnership in this process and my greatly improved health and well-being are reaping the rewards. I do really appreciate how you cater the formula and the acupuncture to my overall and specific needs at the time." Please accept this letter as my personal thanks for the excellent services that I have received from you. As you are aware, several years ago while recovering from a broken rib, my lower back muscles became very sore from the awkward style of walking leaning to the opposite side of the broken ribs. At that time, I attended 5 or 6 acupuncture treatments at your offices and the results were startling – 95% of the pain in my lower back was gone!! It should really not have been that much as a surprise as acupuncture helped me recover from compressed discs about 20 years ago while I was working and living on Ontario. And while travelling about 12 years ago in China, I had acupuncture for lower back pains from being on so many airplanes in my journeys around China. I have returned to your offices this month as a result of a lower back muscle pull from hitting too many golf balls at a local driving range without properly warming up and doing pre shot exercises. Four acupuncture treatments later, my back feels much better. In addition, you have given me a few warm up exercises before hitting more golf balls. These really work too. Then I mentioned some difficulties sleeping and you have me some calcium – magnesium supplements and only after a week, I do sleep much better. I will continue to take them on the road to continuous full nights of restful sleeps. So now my wife has recently turned up at your door with her issues. I have no doubt that you will also be successful with her. As a firm believer in science and modern medicine in our western culture, I also believe there is room for traditional Chinese medicine in our lives. The results speak for themselves. "Chemotherapy for breast cancer was brutal. My sessions of acupuncture with Dr. Jeda Boughton however, were able to lessen the crippling side effects and bring my body and mind back to life. I also credit Jeda's work for saving me from blood transfusions and more medication when my blood counts were low."